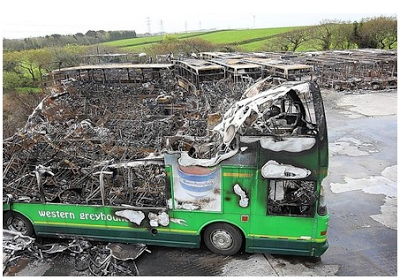 Police say a fire which destroyed a third of all buses belonging to one of Cornwall's two major bus companies may have been started deliberately. The estimated cost of replacing the 35 Western Greyhound buses is thought to be around £1.5 million following the fire at the family-run company's Summercourt depot near Newquay. Today, a police spokesman confirmed that the suspected cause was arson. It is thought the blaze started around 1am on Monday and, fanned by the wind, tore quickly through a large portion of the Western Greyhound fleet, including two new £100,000 double deckers and four park-and-ride buses for Truro. The damage to the fleet has caused a huge disruption to bus services in Cornwall, which are run largely by Western Greyhound and First, and it is not yet known when full service will resume. It was reported at one stage that as many as a third of the bus routes in Cornwall had experienced some sort of disruption, however services were said to be running normally in Devon. Mark Howarth, managing director of Western Greyhound, said he could see flames leaping in the air and that, when he arrived, all the buses at the bottom of the yard were completely ablaze. He said: "It's absolutely devastating. "We have all worked very hard to build up Western Greyhound and it's awful to see something like this happen. "The staff have all rallied round they have been absolutely brilliant. "We managed to run the bulk of our services today, including the Truro Park and Ride. It has been absolutely marvellous how much support we have had from transport companies and manufacturers to try and help us get back up and running as quickly as possible. "I am thankful there was no damage to the offices and workshops and that no-one was injured or hurt." The company announced on Monday morning that 12 out of the 43 bus routes it operated in the Duchy would not be running but the firm managed to ensure that only nine routes failed to run. It is not known how long the other services will be out of action. But, in a gesture of goodwill, First confirmed it would accept Western Greyhound season ticket holders on similar routes over the next couple of days.